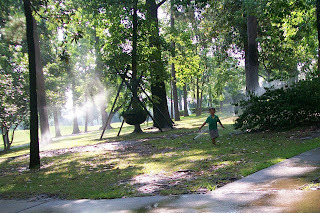 While playing at the park with some friends, the kids noticed that the sprinklers were on, and had a great time running through them. 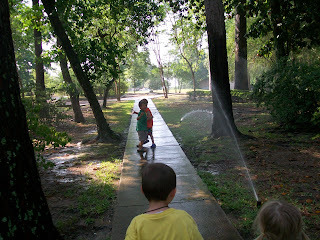 Carson and Dawson beckoning Eli and Rosalie to join them in the sprinklers. 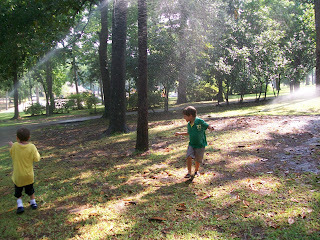 Dawson running through the mist and sprinkles. 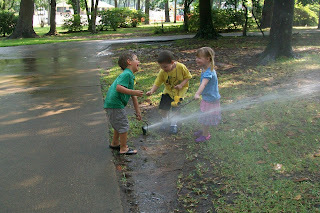 Laughing as the sprinkler shoots them with water. That's adorable, but did you know it's LAKE WATER?! AHHHHH!!!!! What ever will we do?